I was born in 1949 in Grimsby. I couldn't help it - blame my parents. I escaped in 1969 having wowed the grammar school folk club with my renditions of two Tom Lehrer songs, including the inevitable "Irish ballad". I bribed the school's resident good guitarist to accompany me and so, Keith Learmouth, my eternal thanks. I then spent the next twenty years in London. One night (December 1971, I think) I found myself at City University in Islington for a Martin Carthy gig and, being somewhat refreshed, found myself joining the emergent Angel Morris Men. Music sessions always followed practices. I had seen the band Oak (Rod and Danny Stradling, Peta Webb and Tony Engle) and was much taken with their sound and style - memorable tunes played at a steady pace , no frills and the accent on the tune and the rhythm. Very different indeed from the usual Irish and American repertoire. I was particularly taken with Rod's melodeon so I bought a small piano accordian. I think I must have been impoverished and it must have been cheap. Never mind - I could join in the sessions and I soon realised my error and bought a melodeon. Around 1973, a guy called Graeme Smith got off the plane from Melbourne and turned up at one of the practices. 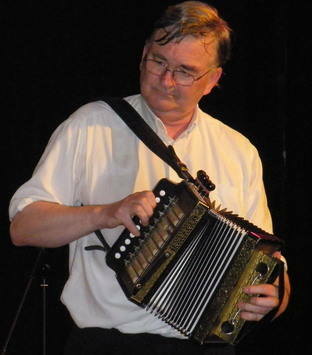 He played melodeon, had an interest in Australian tunes and songs and brought to our attention the Topic album "English Country Music from East Anglia". We were off! From all these elements sprang Flowers and Frolics. Graeme had been singing at the Islington Folk Club (then based at The Florence in Florence St) and persuaded the organiser, Ken Lees, that he needed a resident band and we remained resident band until the mid-eighties.The club had moved to the Empress of Russia in Upper St, Islington in 1979 and they were great times. Apart from us, the residents included Barry Dransfield, Tom Paley, Fred MacKay and Bob Davenport. I cannot thank enough the last two great singers for their support for me and the band. Flowers went through one or two personnel changes and in 1984 we decided we were going nowhere and called it a day. The subsequent Gas Mark Five was a louder version of Flowers - variable backline (trombones, tuba, keyboards and drums) - and Chris Taylor, ex-Oyster Band, on harmonica and electric guitar. To quote Michael Flanders : "A jolly pleasing noise". At the same time, I played in a couple of other dance bands - The Dan Quinn Trio and The Dan Quintet (what names!) Upon my successful attempt to reproduce myself, I quit Gas Mark Five (which continued successfully for many years without me) to spend more time with my family and moved to Sussex, where I remain. You'll find a list of my current activities on the "bands" page. While I have spent most of my adult life playing English traditional music, I have also been more than interested in music from around the world that I consider to be sympatico with the English stuff - music from Australia, New Mexico, Italy and especially music from Quebec in the early 20th century. My comparatively recent discovery of the tunes of Alfred Montmarquette has been an inspiration - see Duck Soup on the "bands" page.